Manny Pacquiao is a terrible congressman: Good thing he never shows up for work. 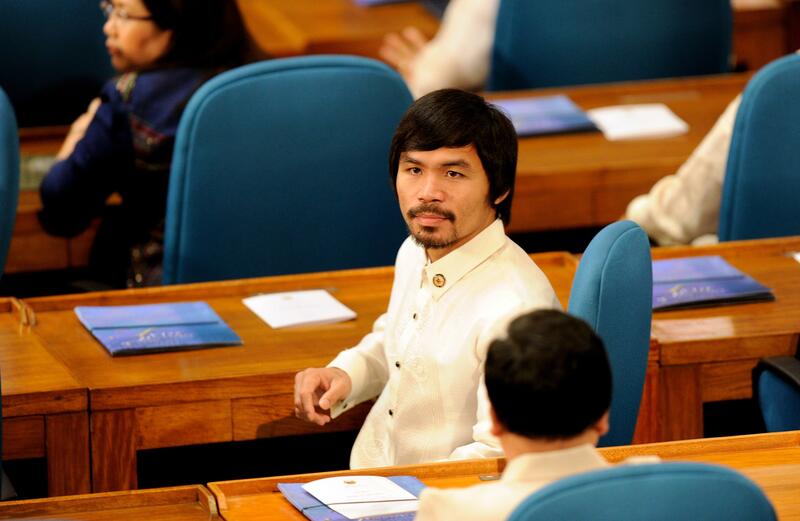 Congressman and world champion boxing hero Manny Pacquiao sits with fellow lawmakers at the House of Representatives on July 25, 2011. Last month on Deadspin, Diana Moskowitz argued against viewing Saturday night’s super-fight between Manny Pacquiao and unrepentant serial abuser of women Floyd Mayweather as a good-versus-evil contest. Pacquiao is a Philippine congressman and, as Moskowitz noted, his political views on contraception, gay rights, and other topics actually have the power to affect the laws of an entire country and hurt people in ways that Mayweather hasn’t. The good news is, Pacquiao doesn’t appear all that interested in exercising that influence. The reigning WBO welterweight champion—and part-time professional musician and basketball player—is currently serving his second term in the Philippine House of Representatives for the southern province of Sarangani. His wife is also the region’s vice governor. But according to the Philippine Daily Inquirer newspaper, while he’s the country’s richest and best-known politician, Pacquiao showed up for work only four days last year, the worst attendance record in the House. It’s true that he and his wife have been generous in sharing their personal wealth with their home district, but the comments suggest that perhaps legislative work isn’t for him, and that he may not understand exactly what it is. This attitude also reinforces the entrenched system of personal patronage that has long plagued the country’s politics. Pacquiao’s truancy has prompted some of his political opponents to call for his resignation, but the fact that his political career is more of a hobby than a job doesn’t appear to bother the majority of people in the Philippines, where he’s a revered national hero and his fights are unofficial national holidays. And given the Philippine legislature’s reputation for corruption, the bar is set pretty low for elected officials. So what are Pacquiao’s actual politics like? As with many Philippine politicians, he’s switched parties several times—the country’s parties often serve more as patronage networks for individual politicians rather than ideological coalitions. He’s filed about a dozen bills, though none has ever passed through committee. His most notable accomplishment as a legislator may have been a much-praised 2010 speech on human trafficking. But that same year, he was criticized for appearing unprepared and ill-informed in a debate over a controversial reproductive health bill. The conservative Catholic-turned-evangelical Protestant opposed the bill on the grounds that it used government funds to make contraception more widely available. Considering the difficulties many poor Filipinos faced obtaining safe birth control before the bill was passed, Pacquiao should probably continue to take off as many days as he needs.